I am standing on the thick frozen ice of Bothnian Bay in Swedish Lapland near Lulea, in a double layered bright orange neoprene suit, with reggae music being blasted out from a loudspeaker of a giant icebreaker that is usually used by the government to clear a path for boats transporting timber from the nearby boreal forest. If this was not surreal enough the next thing I would be doing is sitting on the edge of the ice waiting to be pushed into the near freezing waters of the Baltic Sea! Glamorous, this was not…..
Our voyage to the icy waters of the bay began from a secluded port near the coastal town Kalix. An idyllic drive through snow covered forests of the Swedish archipelago, led us peacefully alongside the powerful icebreaker. Bothnian Bay’s frozen beauty was accentuated by the already setting sun and the fresh snow fall from the night before. The sea waters are covered in solid brilliant white ice, up to 2 metres thick, as far as the eye can see. Once on board the ship groans to life, slowly beginning its journey from the coast to the pack ice of the sea. The first distinguishable sound is the cracking and crashing of the ice beneath the ship. Giant blocks, shards and planes of ice are pushed aside by the powerful ship revealing the deep, dark waters below. On board the ship there is a flurry of activity in preparation for the main event deep into the bay. We head to the bow of the boat peering over the edge and through portholes to watch the ice give way to our route. With bright blue skies above you could be forgiven for thinking it was warm, it was not! Two layers of thermals, followed by a fleece layer, then a waterproof layer and finally thick winter overalls, just about keep us warm from the well below freezing temperatures. Whilst on board we are treated to a tour of the bowels of the ship, visiting the roaring engine room, before heading to the captain’s bridge for the best view in the house. Comfortable commanding his ship the captain finds a spot to clear a pool free from ice, giving us the chance to swim in the dark icy water. We are suited up in the, oh so stylish, double layered neoprene survival suits before waddling off the boat onto the thick ice. Watching others, old and young alike, dressed just like us slip into the water with giggles and glee, we cannot quiet believe the situation. Show a picture of us shuffling along the ice towards an icy whole to some people and the could be forgiven for thinking this was a shot from a sci-fi movie. 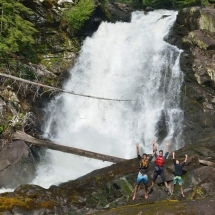 After some group shots and selfies, it was our turn to be dangled over the edge and gently shoved into the waters. Bracing for the cold, I am completely taken back by the warmth of the suit. The thick, buoyant suit allows us to lay on our backs, warm and dry, looking up to the crystal clear blue sky above. The water’s temperature is just above freezing, so much warmer than the air surrounding us when on board the ship. 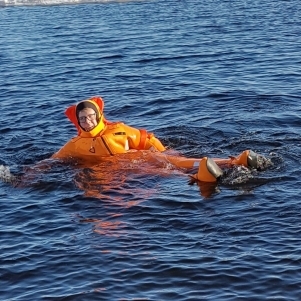 We were told that the survival suit allows you to survive for up to 9 hours in these near freezing waters and I can see why, I was surprisingly warm. To finish our graceful dip in the sea we are ragged by the suit on to the ice. Changing back into multi-layered winter wear we head back to dry land, bringing to an end this truly surreal experience. Finally, back on shore the captain presents us with a ‘Cruise and Swim’ certificate to complete this memorable experience. 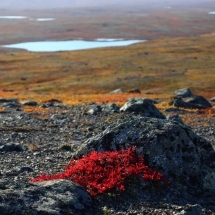 Get in touch with the Magnetic North Travel team to find out more about this trip and other amazing arctic experiences.